Today is the day the scales tip. Exactly 6 years ago yesterday, my kidneys failed and I started dialysis. Exactly 3 years ago yesterday, I received a new kidney. 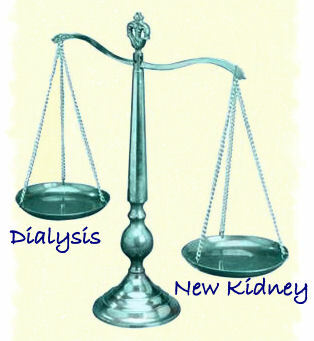 So today, I have had my new kidney for longer than I was on dialysis. Numerically, the good officially outweighs the bad. In reality, though, that happened years earlier, when a young man opted to check the organ donor box on his driver’s license. On the surface, that choice seems to be so easy to make — but many people don’t choose it. I’m not sure I understand why. The person whose kidney I received was able to help a lot of other people, including Rafik, my kidney “twin.” He’s left, I’m right. We met in the hospital, right after our transplants, and have stayed in touch. In fact, one of today’s great pleasures was an anniversary call from him. I’m happy to report that his kidney is also working well. I’m sorry that neither of us was able to meet the donor family, although we both wrote letters the minute we were allowed to do so (one year after the transplant). At first the time restriction didn’t make sense to me, but I’ve come to understand the logic. In this circumstance, the needs of the donor family must come first. They are the ones dealing with loss and grief; the fact that they have put that aside long enough to give such a tremendous gift is more than enough. It is easy (and comforting) to think that all donor families must feel better knowing that “some good has come from their tragedy.” I suspect it doesn’t work so neatly, except in the abstract. Waiting a year before receiving the effusions of grateful people like me allows time for the deepest pain to lessen. Even so, my gratitude is always going to be linked to their loss. My anniversary of life is their anniversary of death. I hope my letter to them comforted. And if they wanted additional contact I would be very, very happy to meet them and to learn more about my donor. They are a big part of my life. I am thankful every day for this life. I am grateful, too, to the people who offered to be live donors. I’m still overwhelmed when I think of the people who offered to donate a kidney to me. When I celebrate the success of my transplant I celebrate each of them also, and I count them all as part of the outcome. Experiencing such goodness and generosity is a gift that is perhaps more powerful than the kidney itself. You don’t have to be dead to donate an organ; nor do you have to be in perfect health or below a certain age. I have been an organ donor for a very long time; the transplant just means that my kidneys wont be among the parts harvested. Becoming an organ donor is simple: just select that option on your driver’s license or register at OrganDonor.com (U.S. only). A driver’s license is not needed. It’s also a good idea to carry a donor card in your wallet. A printable page of 8 cards (share with friends and family) can be downloaded from the Organ Donor site. Just click the card to link directly to the page. 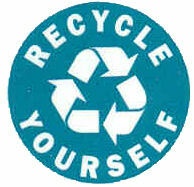 Organ donation is simply a more personal version of recycling. As a society we understand how critical recycling is if we are to save our planet. I believe that organ donation simply extends that coverage to include the people on our planet. Please consider being an organ donor if you are not one already. And tell your family that you are a donor, so that they will be able to carry out your wishes. In the meantime, live joyfully and take care of yourself and those you love. Signing my organ donor card was one of the most satisfying things I’ve ever done. And in a strange way, it’s encouraged me to take better care of myself, knowing that someone else might be depending on my spare parts someday. Your post is heartfelt, and I’m glad you’ve turned this experience into such a inspiring thing. Thank you for sharing your story. I represent the Michelle’s Angels Foundation, Inc. at which we perform many deeds in an effort to provide love, hope and assistance to those who quietly suffer. At present, we are searching for a kidney donor for one of our volunteers, Alicia Lee. See: http://www.michellesangels.com. There you will hear a song we recorded last Christmas entitled: “Life Lives On” which is available on our website for free downloads. It was written by Nashville based singer-songwriter Ken Harrell and sung by award winning artist Kim Parent. Enjoy. Meanwhile, we pray we are able to identify a donor for Alicia Lee soon so we are able to save her life. Please share her story with others. You will find it on our website’s homepage. I hope that a donor for Alicia Lee will be found. I have encountered so many good, giving people over the course of my experience that I can’t help but feel optimistic. All good thoughts for Alicia and for the efforts of your organization. R.